iGoogle is a start page feature from Google. You can customize and add content as per your liking: from changing the look of iGoogle homepage to useful functionality like sending files via iGoogle chat. It has option to browse RSS feed content of any website or blog. 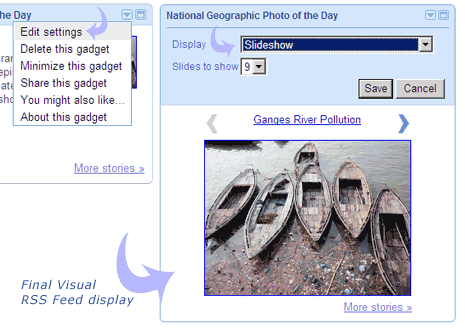 Now you can browse such RSS content in visual manner in the form of photo slideshow. 1. Goto www.google.com/ig and login into your Google account. 2. Click ‘Add Stuff’ button at top right part. On the next screen at the bottom left, click ‘Add feed or gadget’ link. 4. After adding feed, click on iGoogle icon to go back to iGoogle homepage. You will see feed box at top left part of iGoogle page. 5. Click on down arrow key and then click ‘Edit Settings’ button. Select ‘Slideshow’ option from drop down box and click ‘Save button.